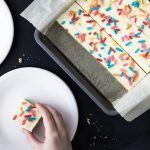 Super soft and easy Keto Funfetti Cake Batter Sugar Cookie Bars! Gluten free and low carb, with healthy sugar-free frosting and homemade keto rainbow sprinkles. Yup, that’s a terribly long recipe name, but these cookies are pretty darn delicious so I’m letting it go. 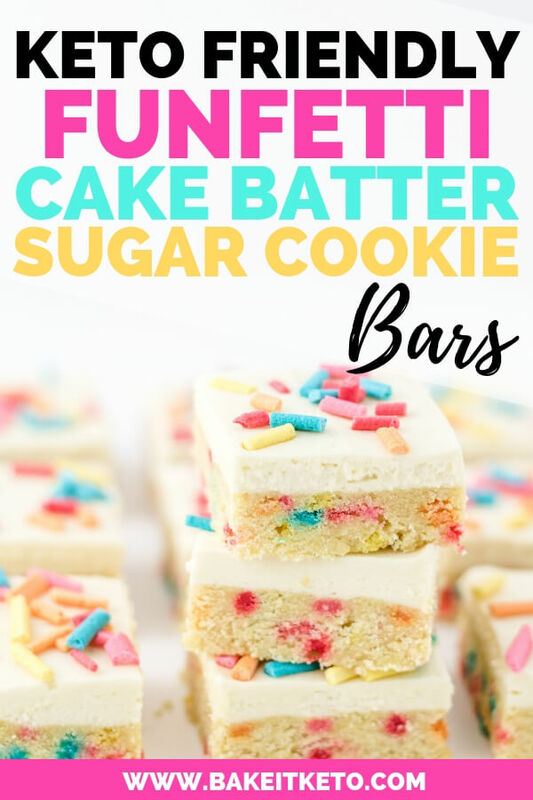 This recipe is keto funfetti cake batter cookies and keto sugar cookie bars, all rolled into one! Of all keto cookies, keto soft sugar cookies made with coconut flour are one of my favorites. I’ve always loved super soft, Lofthouse style sugar cookies, but I’m 100% sure that they taste better in my memory than in reality. Let’s face it, they’re made to be able to sit on the shelf at Target or Walmart for a while. Homemade definitely tastes better! As a Type 1 Diabetic, I’m always looking for ways to cut out sugar, so these low carb sugar cookies are made with erythritol. I used granulated Swerve and coconut flour in the cookie bar base and confectioners Swerve in the frosting. But what about those sprinkles?! I often get the question of where to buy sugar-free sprinkles. And the answer is that I just make my own. Seriously! 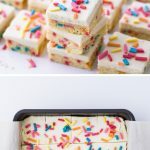 It is so super easy with my recipe for homemade sugar-free keto rainbow sprinkles. You can even make them in whatever colors you want for a holiday, your favorite football team – whatever! American buttercream is the thick and sweet frosting recipe made from butter, confectioners sugar, milk, and a little vanilla. The pastry chef part of me wants to point out that this isn’t considered real buttercream in the classical pastry world. I love it for a soft sugar cookie though (for cakes I recommend Swiss or Italian meringue buttercream). For this keto American buttercream, you’ll cut the carbs by using heavy cream in place of the milk. And instead of confectioners sugar, you’ll use a fantastic sugar-free powdered sugar substitute: granulated Swerve. 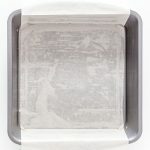 Grease an 8 inch square baking pan and line it with a strip of parchment paper (I used a nonstick metal pan). In a small bowl, combine the coconut flour (sift if yours is clumpy), baking powder, collagen peptides, and salt. In the bowl of a stand mixer fitted with the paddle attachment, cream together the butter, granulated Swerve, and cream cheese until light and fluffy. Scrape the bowl down with a rubber spatula as needed. Add the egg to the butter mixture, followed by the extract, beating to combine after each addition. Add the dry ingredients to the butter mixture and beat until thoroughly incorporated. Scrape the bowl down again, and then use the rubber spatula to fold in the sugar-free rainbow sprinkles. Spread the cookie dough evenly in the prepared pan. I use an offset spatula for this. Bake the cookies at 325 degrees F for 18-20 minutes, or until the edges have just begun to brown and the center is just set. Allow the cookies to cool in the pan. In the bowl of a stand mixer fitted with a paddle attachment, cream together the butter and confectioners Swerve (if yours is clumpy, sift it into the bowl). This will take a few minutes and the mixture might seem dry at first. Scrape the bowl with a rubber spatula as needed. Add the extracts, salt, and heavy cream, and continue beating the frosting until light and fluffy. Once the cookies are completely cool, use an offset spatula to spread the frosting evenly over the top. Use the parchment paper lining to pop the cookies out of the pan and transfer them to a large cutting board. 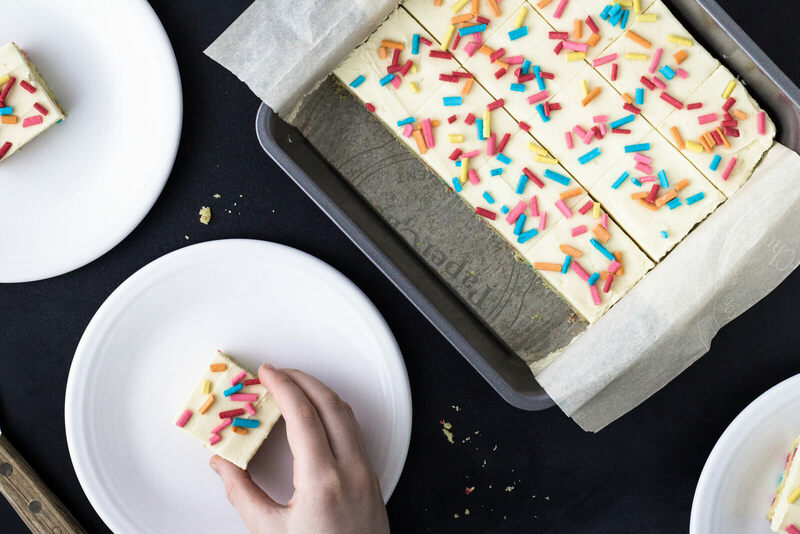 Slice the cookies into 16 bars and then sprinkle them with more of the homemade sugar-free rainbow sprinkles.